In the spring of 2000, activists including ACORN, the WEP Workers Organizing Committee, and the Rev. Al Sharpton marched against low-wage jobs at the Forest City Ratner’s Atlantic Center mall and Regal Cinemas in Brooklyn, as described in William DiFazio’s 2005 book Ordinary Poverty. The low end of the retail wage scale usually doesn't pay living wages. So it’s notable that Atlantic Yards Community Benefits Agreement (CBA) signatory BUILD (Brooklyn United for Innovative Local Development) recently began to focus on unpaid customer service training--involving classroom sessions and unpaid internships--to position people for hospitality and retail jobs. 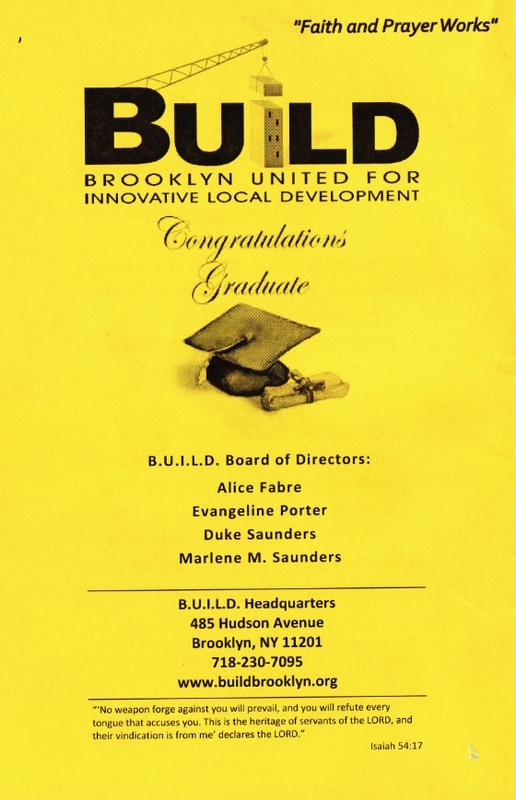 After all, BUILD--which had no track record in job training but is led by people with records of community service--was established with the expectation of high-paying construction jobs at the Atlantic Yards project. The CBA mandated that BUILD offer pre-apprentice construction job training, funded by Forest City Ratner, with the implication that it begin shortly after the CBA was signed in 2005. That finally happened last year; today, some who went through training have filed suit saying it's a sham. 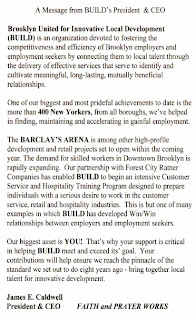 At the least, as I explain, Forest City is now emphasizing that the program--promised as training "Community residents for construction jobs within the Arena and Project"--aims "to help new workers "develop the kinds of skills that they can use beyond this project." Meanwhile, in an economically polarized city, BUILD has been trying to make the most of more modest offerings. 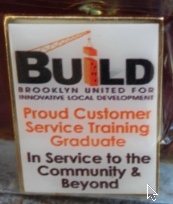 On November 8, BUILD held an elaborate graduation ceremony in Crown Heights for the first seven-week round of customer service training. 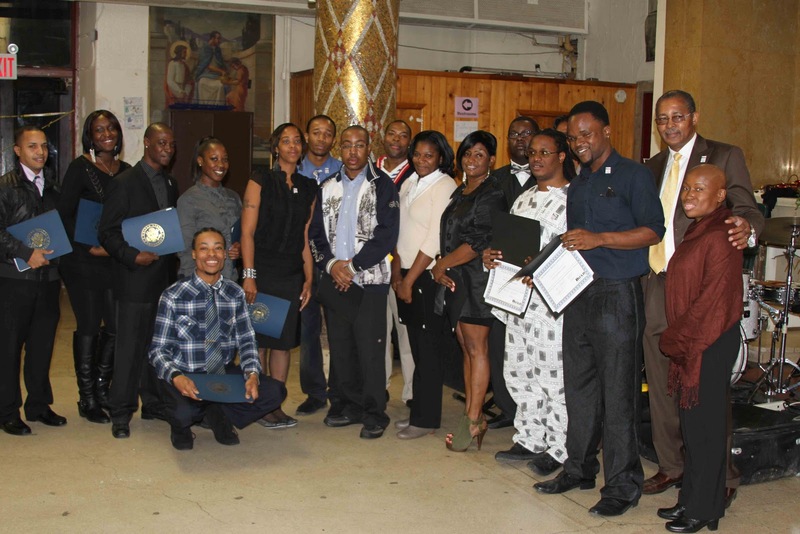 Some 13 of the 25 participants attended, along with family members, community members, and those in the second round of training. There will be three more groups of 25 students; more than 350 people have expressed interest in the program, a sign of the endemic unemployment in New York. The training program, which included free MetroCards to cover participants' travel, represents a modest expenditure by Forest City Ratner compared to its spending, say, on lobbying and public relations, or even the sum, up to $100,000 annually, that the developer has failed to allocate to the CBA-promised Independent Compliance Monitor. There was no one at St. Teresa of Avila Church to suggest that the developer could be doing much more, or that BUILD in signing the CBA could have extracted a greater community commitment. 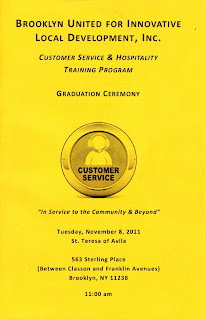 Still, it should be noted that the program was embraced and appreciated by the applicants at the ceremony, who felt it would give them a boost. They had the time, willingness, and fortitude to go through unpaid training to learn some “soft skills” and job readiness that some more advantaged youth pick up more easily. The ceremony was saluted not only by a Towns rep but also two District Leaders and one City Council Member, Darlene Mealy. That suggests not merely the program’s significance but also the power that Forest City Ratner maintains and the respect that BUILD's Caldwell, longtime President of the 77th Precinct Community Council, retains. 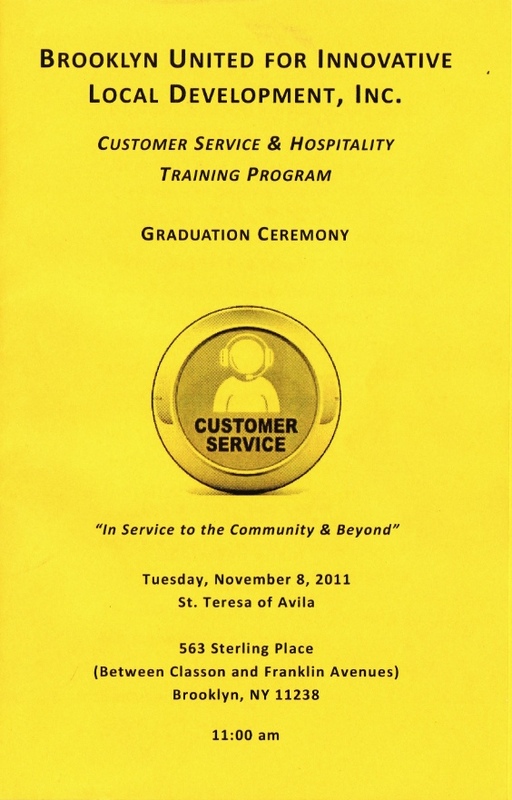 BUILD’s promotion for the training program, below, suggested the possibility for work "in the retail and hospitality industries, both in, and around, the Arena," and pictured the arena. But participants told me they had been clearly informed that, while they might have a better shot at arena jobs, they were not guaranteed. BUILD, spurred by then-Assemblyman Roger Green, was organized to help with job training, funded steadily by Forest City Ratner and later some city funds channeled through the city-funded, union-run Consortium for Worker Education (CWE), as well as the Workforce Development Corporation. BUILD occupies a significant storyline in the documentary film Battle for Brooklyn, first at public rallies in support of the project, then a press conference based on BUILD's erroneous claims, in IRS documents, that it expected $5 million from Forest City Ratner in its initial two years. Actually, it's been more than $1 million since 2005. Though the film can leave the impression that BUILD was being paid by Forest City beginning in 2004, BUILD officials say they did not get paid by Forest City until 2005, after the CBA was signed. That said, BUILD leaders for a few months in 2005 lied that they were unpaid. 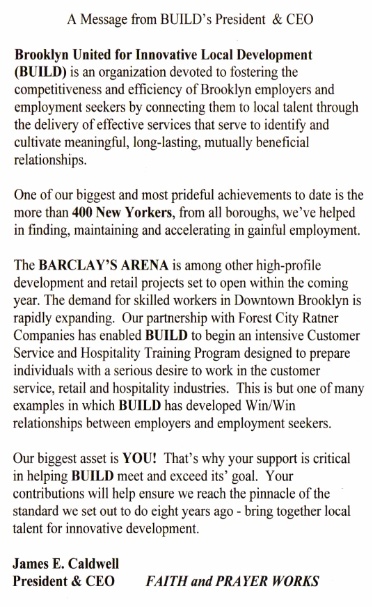 BUILD has been invoked by Forest City Ratner as evidence of its community commitment. “Last year, BUILD provided more than 1,200 local residents with job training or some type of employment support,” Forest City Ratner executive MaryAnne Gilmartin wrote in a February 2010 New York Observer op-ed. Not coincidentally, BUILD officials have vigorously advocated for the project at public hearings and brought numerous supporters and members. BUILD offers general job counseling--job search, applications, practice interviews--at its Forest City Ratner-provided offices at 485 Hudson Avenue, just off Fulton Street as Downtown Brooklyn intersects with Fort Greene. As of this past summer, it had helped more than 350 people get work, including at Forest City’s malls, as well as in other relatively low-skilled jobs. One of our biggest and most prideful achievements to date is the more than 400 New Yorkers, from all boroughs, we've helped in finding, maintaining and accelerating in gainful employment. It's not completely clear from that phrasing whether 400 people got jobs, or the total involves some who already had jobs and were assisted in other ways. Caldwell, an Army veteran and former auto salesman, has concentrated in more recent years on community service, rebuilding the precinct council, some of whose members serve on BUILD’s board. And Caldwell’s circle has also served, at least according to some reports, as a political base. So while it may seem unusual for a civic group to recruit a community affairs police officer to sing the national anthem at their ceremony and to help serve lunch, in Caldwell’s view, that fell under the rubric of community affairs. Religion infuses BUILD’s mission and the rhetoric of Caldwell and Louis and, indeed, the program began and ended with a prayer. “Down at BUILD, we have a Harriet Tubman state of mind, we believe that you should always go back to try to help somebody else,” declared Caldwell, his accent still reflecting his South Carolina boyhood. And Caldwell, unlike experts on CBAs, finds no problem with community groups dependent on a developer. He’s proud. “Because the funding they provide to us is why we can do what we do,” he said. “We really do have a legitimate seat at the table.” And, I’d point out, an incentive to support the project in a way an established job-training group might not have done. And then Caldwell linked Forest City’s desperate search for investors in the New Jersey Nets and Atlantic Yards--”had to go to on a plane to go Russia, go here, go there”--to the need for the young adults from the ‘hood, participating in the ceremony, to persevere. 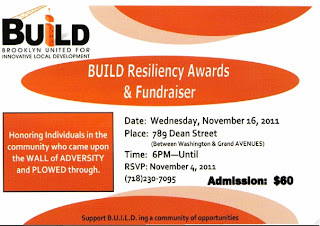 In keeping with the theme, BUILD is holding an event tomorrow night, the BUILD Resiliency Awards & Fundraiser, "honoring individuals in the community who came upon the wall of adversity and plowed through," as indicated in the graphic at left. Mealy moved toward a modified call-and-response, emphasizing the importance of self-discipline and the toxic influence of associates who disdain such commitments. “When you hang out at night, are you ready to get up and go back to work?” she asked. “Let ‘em hang,” responded a voice from the audience, gaining assent. “Are you really ready to sacrifice,” she asked, getting assent. Later, one of the instructors, Malik Heckstall, explained, “We asked every person to make an internal change,” advice that it takes self-discipline to go to work and to stay motivated at a job may, at best, be a stepping stone. In her turn at the podium, Gail Muhammad, a staffer for Rep. Ed Towns, noted that the hotel business was growing in the borough. “I’m hoping that this means that we have a lot of people in this audience that will be working and welcoming people to the great city of Brooklyn," she said. Male District Leader Walter Mosley, widely seen as a potential candidate for his friend Hakeem Jeffries’ Assembly seat should Jeffries, as expected, run for Congress, was effusive. Mosley is the son of Marilyn Mosley, president of the political club Progressive Association for Political Action (PAPA). After affirmative response from the audience, Mosley thanked the group, again saying he was speaking on behalf of Jeffries. I spoke with a few of the graduates. Gershome Johnson, a 29-year-old from Fort Greene/Bed-Stuy, said he had experience doing building maintenance and working for cleaning companies, but was currently out of work and studying for his GED. He said he’d learned how to dress business casual and some business jargon, but most importantly, he learned to have a positive attitude. “It became like a family to me.” And Johnson said his internship, at a local supermarket, was paid--unlike most--and seemed likely to result in a permanent job. Instructors Heckstall and Daisy James and, she said, “were like a big brother and big sister. They told you how it is: it’s never personal, it’s always business.” Bady, who said she learned from her internship working in a flower shop, said she'd just gotten seasonal work in retail. Lufthansey Josa, 22, Flatbush, had contacted the Atlantic Yards development seeking a construction job, but was sent to BUILD. A high school graduate who’s done newspaper distribution and also pursues acting and music gigs, he said of the training, “even though some of it was scripted, some of it was coming deeply from the heart.” Josa, who appreciated the opportunity to intern at a clothing company, said he thought the training would bolster his resume. What did he blame for the situation, I asked: family? the school system? popular culture? Mayor Mike Bloomberg, belatedly confirming the Caldwell's overall analysis, on 8/4/11 announced the "Young Men’s Initiative, the nation’s boldest and most comprehensive effort to tackle the broad disparities slowing the advancement of black and Latino young men." Then again, as the Village Voice reported, Bloomberg was also busy putting such young men in jail for minor violations, such as marijuana possession. In September, the police department adjusted that policy. But the issue of improper stop-and-frisk actions remains to be addressed, as Manhattan Borough President Scott Stringer recently pointed out. And Bloomberg, of course, was much more ready to put at least $171,5 million in city money (before adding housing subsidies) into Atlantic Yards. Some of that, it might be said, is trickling down.